Who got the Illuminated Star installed? Thanks Peter, I'll use your pic's to install my LED Star once it arrives. I'll get some wire first though. 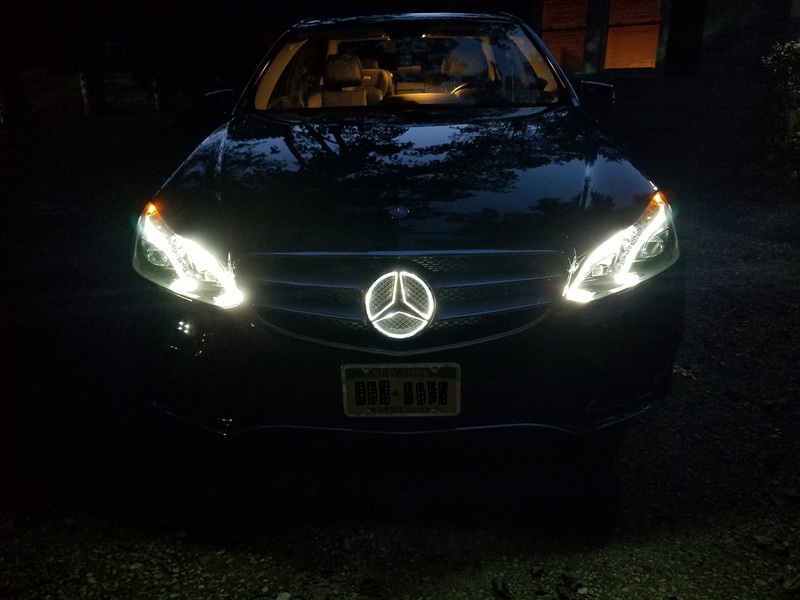 can anyone help me in nj install the lighted emblem? i just received the fuse tap on ebay and it have 15amp fuse come with the package... how i use this? remove the fuse24 from fuse box and insert fuse tap with 15amp at fuse#24? The instructions that came with my wire tap (Lumision) indicate that the existing fuse goes in the lower opening in the fuse tap and that the new fuse for the new device (i.e. LED Star) goes in the top opening in the fuse tap. Check on line for instructions for your tap first or, if you use the same fuse as the OE fuse in each opening you should be fine. 1- pull out the fuse on Fuse #24? and insert the fuse tap with the 15amp fuse and fuse #24 on each slot on fuse tap? If using the fuse tap, you must use the fuse #23 (20A) because the fuse tap won't fit into the fuse #24. The wire that comes out from the fuse tap is on the left side fuse #23. The original 20A fuse is in the bottom slot and the 15A fuse to the LED wire is on top. I drilled the hole "A" as the dealer instruction for the LED wire. Just installed mine today. Didn't use a fuse tap. Ran the red/power wire to left side of fuse #23 through a small hole I drilled in the left side of the front SAM case. Ran the black/ground wire to an existing post holding an a/c line on the shock tower and followed the OE directions to route the LED wires along the side of the top right gutter and wire-tied them to the existing OE wires there. I ran the final length of LED wires under the top right radiator cover into the round area behind the Star. Secured the LED wires in various places to keep them from moving around or sitting in potentially damp areas. The wires that came with the eBay LED Star weren't long enough to reach the fuse box, so I added about 3' of 18 AWG black and red wire with two pinch connectors. For protection and OE looks I ran the added wires through 1/4" black shrink tubing before connecting them to the wires supplied with the LED star (those wires were already covered in black shrink tubing). Looks great, works fine. Will post installation pic's tomorrow. Last edited by Tump43; 09-11-2017 at 10:01 AM. Mine gets delivered next week and I too will share installation photos and tips. 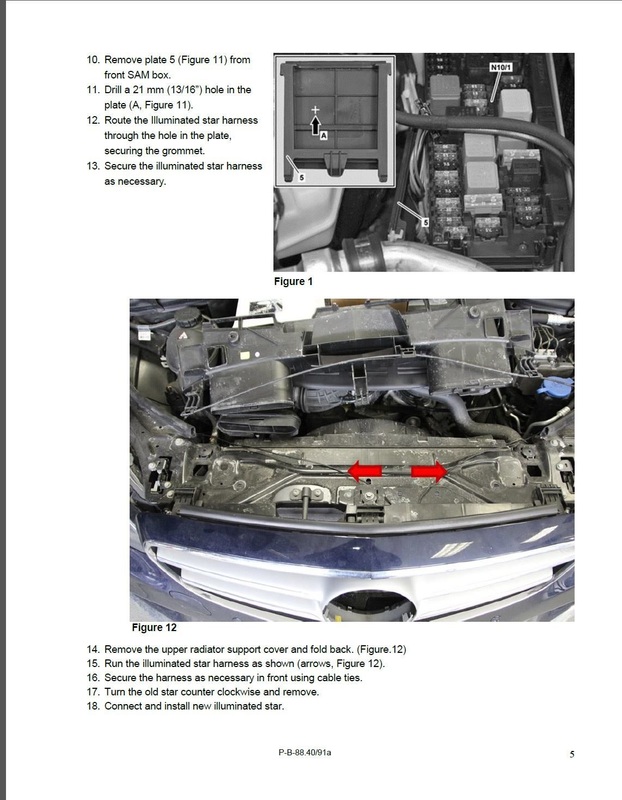 1)Power Connection to left side of fuse #23; 2) Ground Connection to A/C hose support on shock tower; 3) Wire Routing-A beside driver's side gutter; 3) Wire Routing-B beside driver's side gutter; 4) Wire through top left hand corner of fan cover to back of Grill; 5) Wire connectors behind Star; 6) Done. Last edited by Tump43; 09-10-2017 at 08:59 PM. 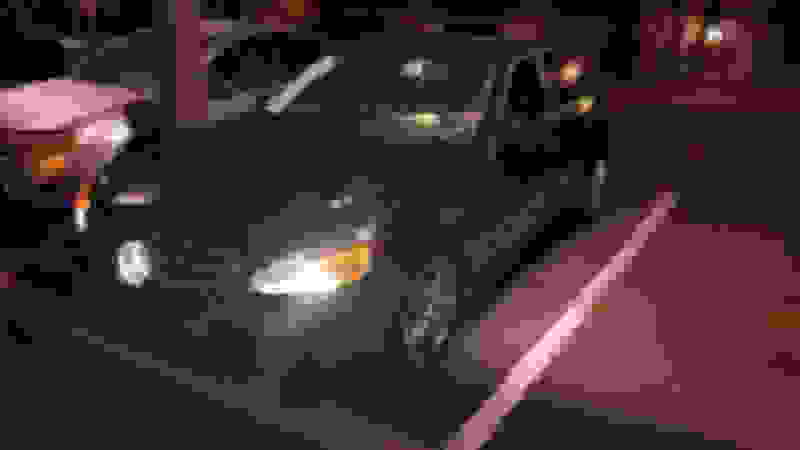 With this install the Star lights up when the car is started, unlocked, and for 30 seconds after it is locked. Even though it is on, it can't be seen in daylight. The ends of the eBay wire loom are poorly secured and I feared they may pull out of the weather-tight plug so I added some shrink wrap and electrical tape to them first. The wiring loom that came with the kit is too short to reach the fuse box, so I ran the wiring loom from the grill as far as I could to the driver side shock tower. 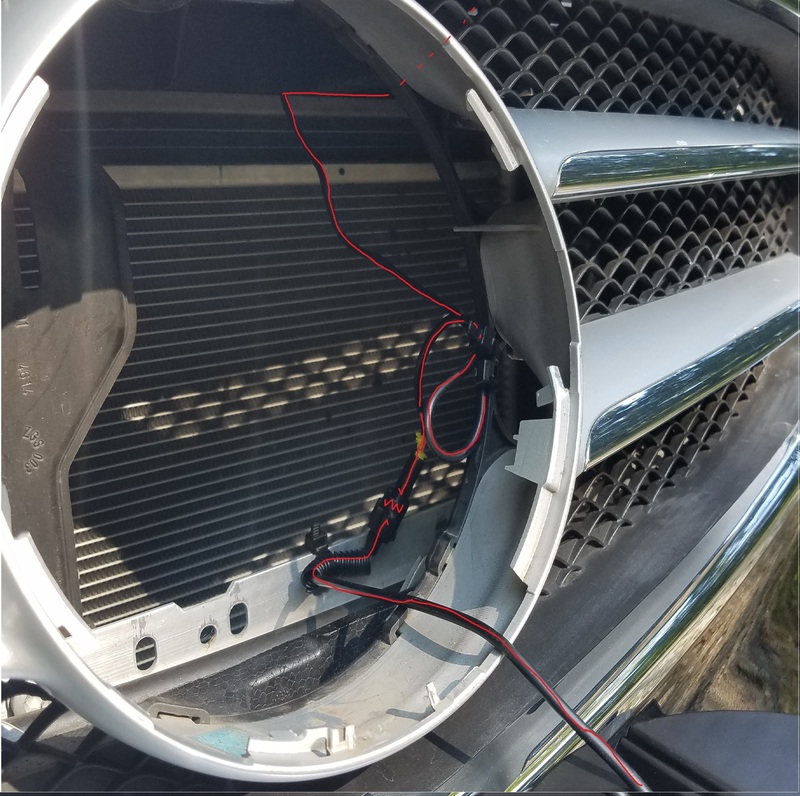 I zip-tied the end of the wiring loom (with the weather-tight plug) to the horizontal aluminum channel that is behind the grill. If you look through the hole where the star goes, you can see a hole in the upper right-side of the grille. 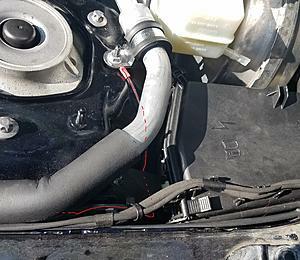 My wire loom came out there and I followed the path of the cable that opens the hood as it runs real close to the fender and is out of sight when finished. I bought a red and black spool of 18 gauge wire and crimped/shrink-wrapped it to the end of the wire loom. I put a ring connector on the black wire and attached it to the ground as Peter_02AMG showed. 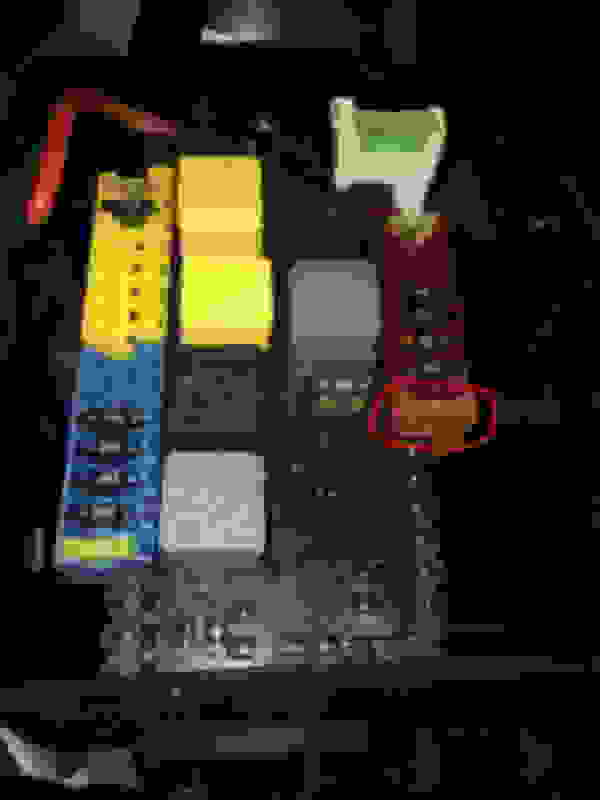 I ran the red power wire to the fuse box on the left side and wrapped it around the left blade of fuse #24. After everything was run, I plugged the weather-tight connector to the star and tested it before I buttoned everything up. When you finally go to install the illuminated star in the grille, be careful, as it will only go in one way easily. If it feels like you have to force it, take it out and re-index the tip of the star. I think it goes in with the tip starting at the 11:00 o'clock position and then you turn it clockwise. Once that was done I zip-tied everything and re-attached the fuse box cover. Last edited by apg231; 09-25-2017 at 10:54 AM. 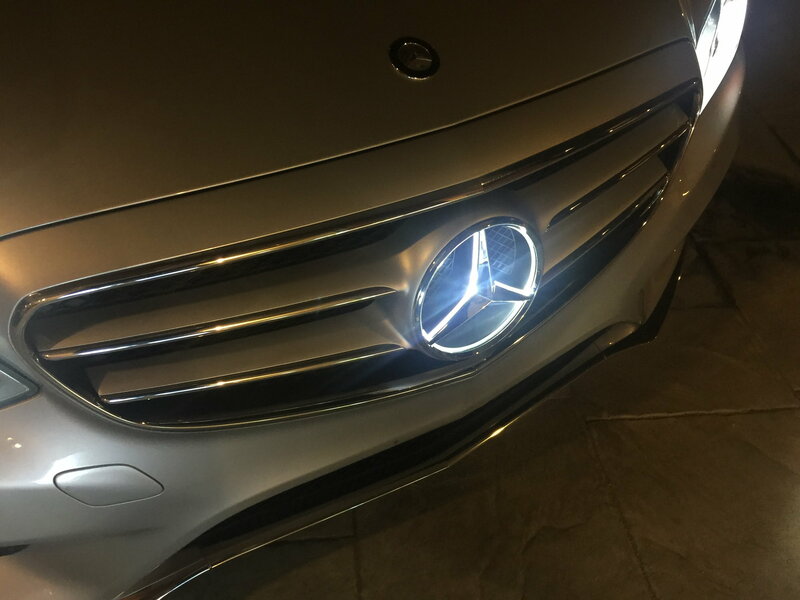 This ebay Illuminated star have to be the best quality replica of the original MB star. I held the original in my hand and I can't tell the different. btw..be careful not to break the little tabs that lock the star into the grill opening. There are 3 location on the grill that have this plastic thing. I broken the bottom clip probably from removing it to many time. If your star doesn't sit flush and tight than one of the plastic clip have broken off. It can't be replace or repair. Get a new grill or live with it. I RTV the star onto the grill permanently this also keep anyone from stealing it. Thanks everyone - this is great info. I just got my illuminated star today and planning to install in the next couple of days. I understand that you can do the direct connection with the left side of #23 (or #24) or the fuse tap with #23. My question is that there are two spare fuse slots next to # 33 (across from #23). Are these spare slots powered, can I use the fuse tap into one of these and not have to sue existing fuses? Thanks! Just had mine installed too, we used Fuse 23 as well. I will post pics soon. How to install aftermarket star in 2017 GLE?? Have aftermarket star with 2 wires--a ground and a hot wire (red). install it so it is on with the when the headlights are on at night. Can anyone provide instructions specific to the 2017 GLE350? to go into the fusebox. The aftermarket star does not have an inline fuse. Is it necessary?? I paid $35 plus 30 min of my time. Quality is exactly like the OEM. So much easier to install than OEM. 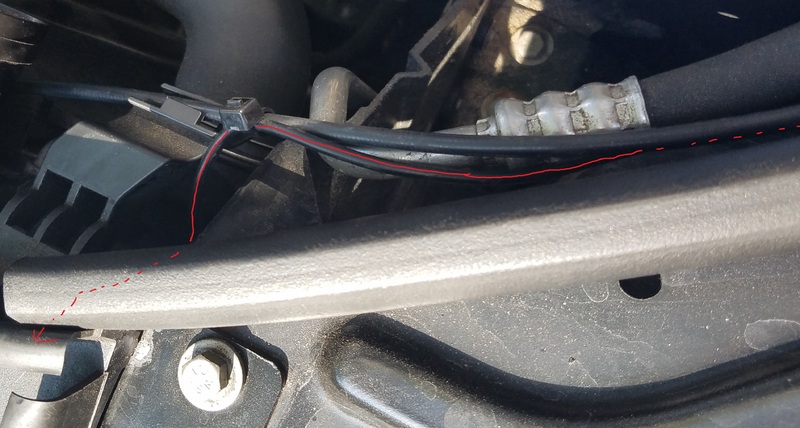 Two wires hookup instead of the spaghetti MB harness. I have a 2018 GLE350(W) with the Iluminated Star. 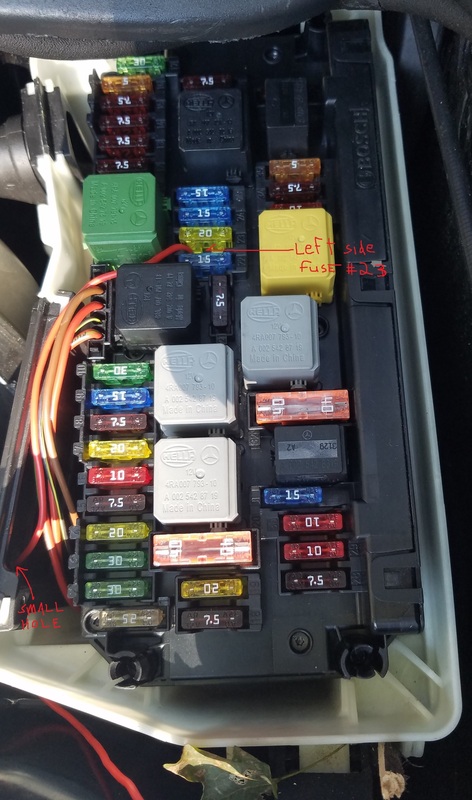 It only comes on with the ignition(See circled 5amp fuse). I want it to come on with the parking lights........ie-when you unlock the car. Where can I find a diagram of my fuses so I can tie into the parking lights? I have spent all afternoon looking at my manual and searching online. My 2015 E350 Does have Distronic, so does that mean I Can't retrofit the "Star" emblem with a lighted one? 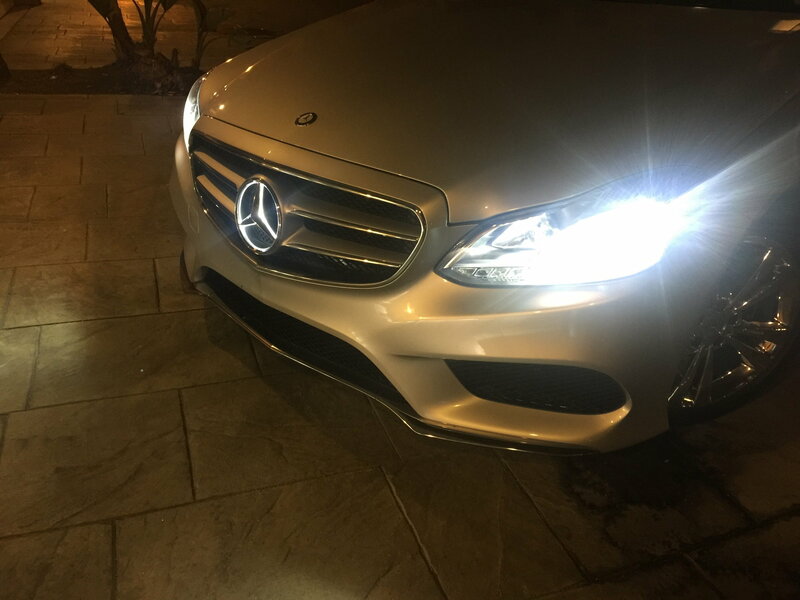 I am having trouble removing the star from my facelifted AMG grill. Is it possible to remove without removing the entire grill? I tried turning it and it would not budge. you may have one of those grill stars that cannot be removed. They are built into the grill from what I have heard. Hopefully someone will know if you car is one of them. I know my aftermarket grill has the star removable and MB is selling those stars separately. Whenever some grill might have them mounted permanently is to be check. I looked around the spare tire and didn't find anything. Thanks anyway.